People who know me tell me that I turn little crazy when I start missing certain food. Food has that kind of effect on me and some days, it can turn my life upside down! It is especially so if I don’t get to eat full-fledged South Indian breakfast of Idli, Vada and Sambar at least once a week and begin to show withdrawal symptoms. Notice that gorgeous bowl of Sambar up there? It’s called Arachuvitta Samabr. 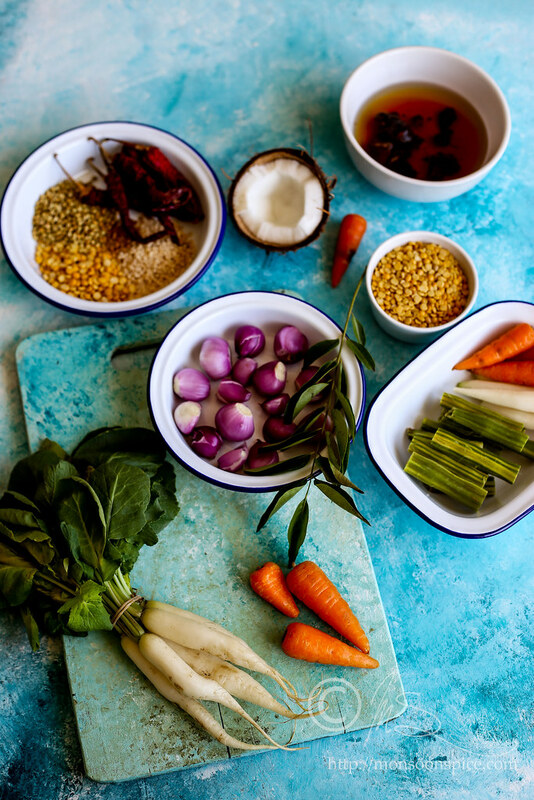 This little tongue twister is a wonderful Tamil Brahmin Tiffin Sambar recipe where fresh ground roasted spices and coconut mixture is added to the simmering pot of vegetable and lentil stew with tamarind extract. 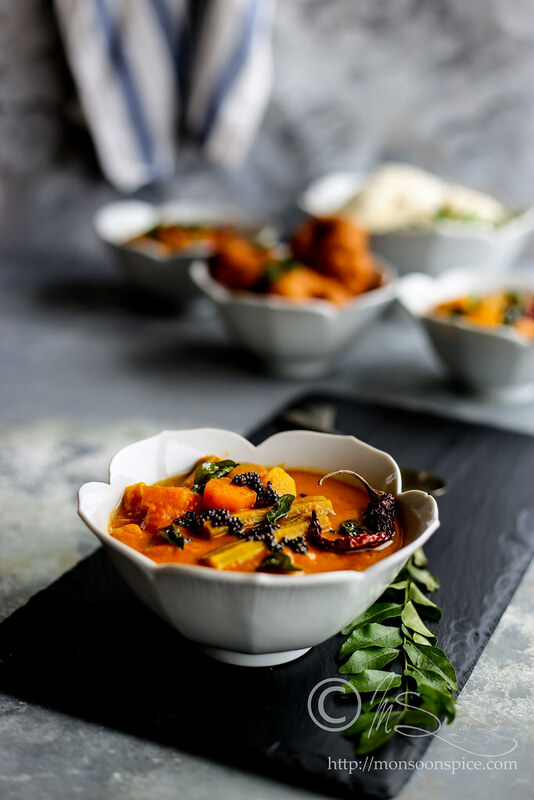 Unlike other sambar recipes, this one uses fresh ground spice instead of ready to use sambar powders which makes it finger-licking good! The ingredients which we find in sambar powder has dried red chillies, which surprisingly came to India only in the 15th or 16th century by the Portuguese from Mexico. Not just the chillies, but also tomato, potato and onions were not part of ancient Indian cuisine and were introduced by the western settlers and invaders around the same century. 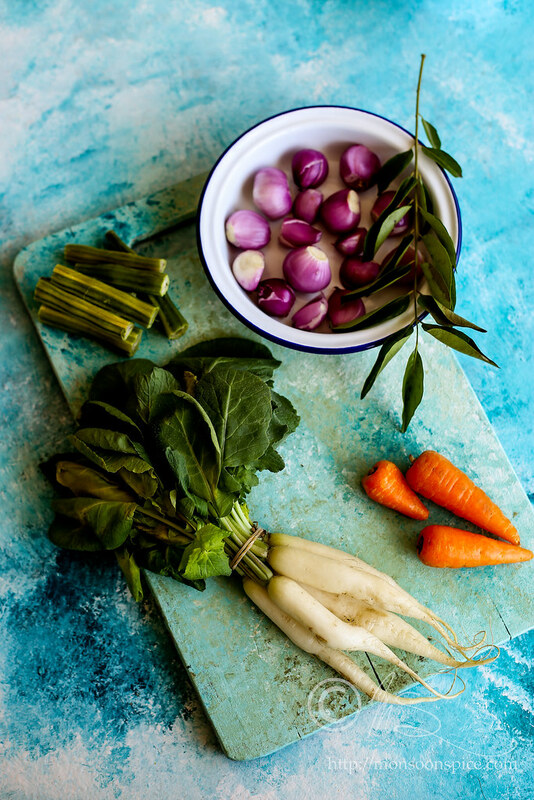 It is quite interesting that these ingredients have become a staple in many food preparation all over India and Indian subcontinents and are as Indian as it gets. Prior to red chillies became an integral part of cooking, it was the black peppercorns and ginger which added the heat to the curries and other food preparations and to this date, many South Indian recipes still uses black peppercorns and ginger (both in fresh and dried form) to spice up the dish and also for their immense medicinal properties and health benefit. 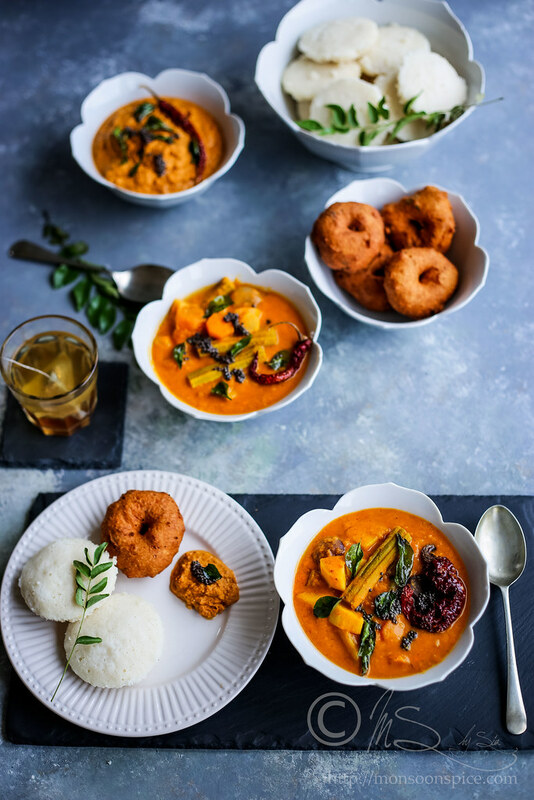 We are so used to seeing the red or orange hued curries, it is bit difficult to imagine pale coloured sambar or other curries and this just shows how Indian cuisine has embraced the chillies as it is their own home produce! And so are the potato, tomato and onions without which it is difficult, if not impossible, to imagine the current Indian cuisine! 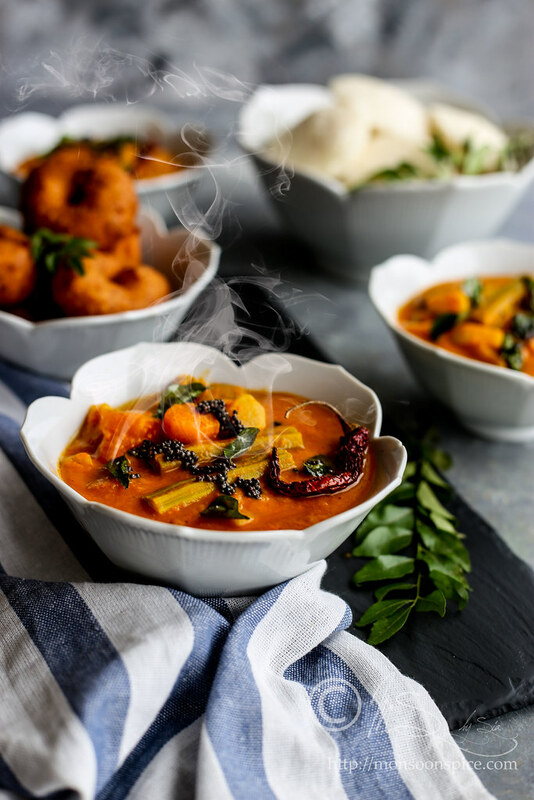 Talking about the spices, vegetables and sambar, there is also an interesting story about the genesis of Sambar or Sambhar (pronounced sa-am-bha-ar). 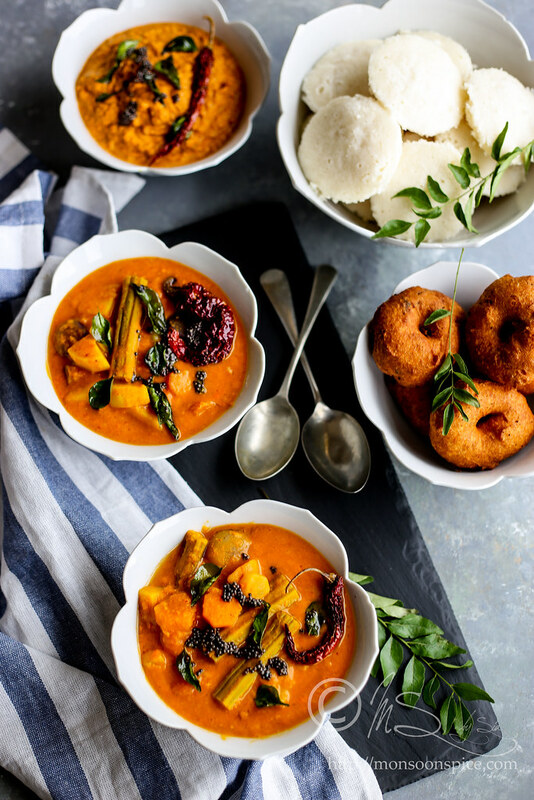 South Indian food, people and culture are inexorably linked to ubiquitous dish as in Idli and Sambar, Sambar and Rice and so on. 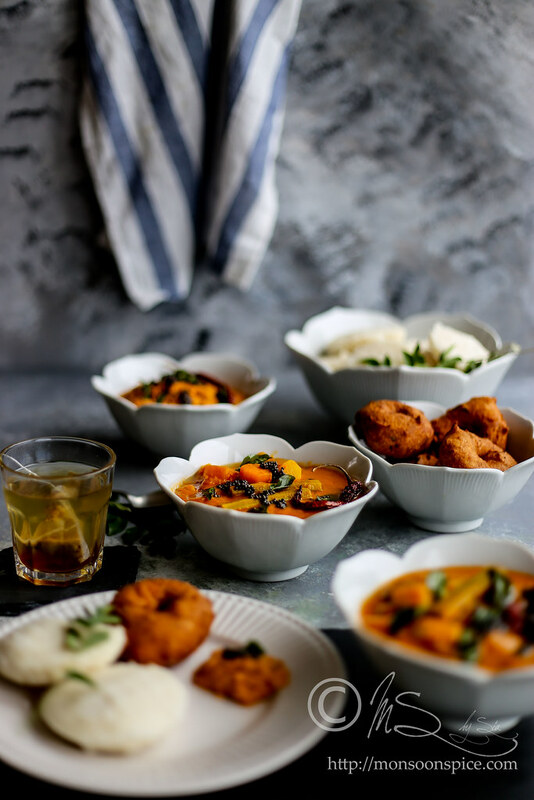 Like with any Indian dish, each South Indian states and the regions with in each states has its own version of Sambar with different ingredients and cooking techniques, adapted to suit their taste and environment. It can be argued that the dish was part of Tamil cuisine for a long time. The etymology of the word Sambar comes from the Tamil word ‘Chaampu’ meaning ground paste or fine paste. So any curry made from ground paste of spices and other ingredients is technically Sambar or Kulambu (which means ‘emulsion’). There are historical evidences which point to the inscription from the early 15th century CE which speaks of Chambaram and Amuthu (rice) and it is believed that the word ‘Sambal’ in South East Asian cuisine carry the same etymology. 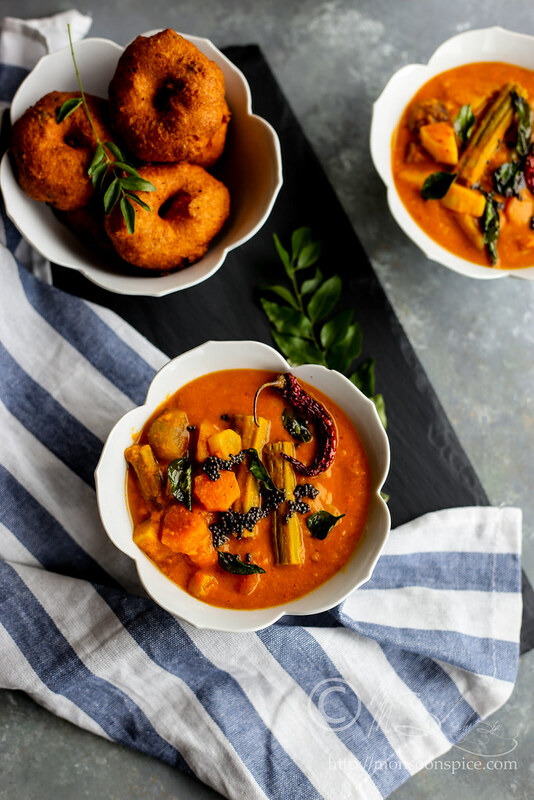 But interestingly, the tale of Sambar is not that old, and contrast to the popular belief, Sambar is not South Indian creation and it can be argued that it was never a part of ancient South Indian cuisine! The interesting saga of Sambar traces back to Tanjavur Maratha Kingdom of the Bhonsle dynasty between 17th and 19th century, founded by Venkoji who was the half-brother of the great Maratha king Chatrapati Shivaji. 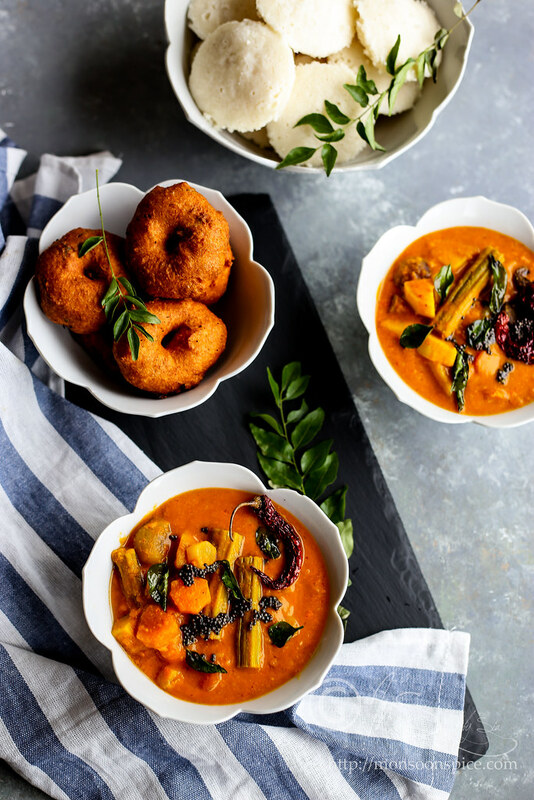 There are two versions of story behind the dish as we know it today as Sambar, and as per the first one goes, it was created in the royal kitchens of the Thanjavur Maratha King, Shahuji in the 17th Century. King Shahuji had a special guest of honour at his court, and ordered his cooks to prepare a grand feast. No Maratha royal feast was complete without serving the traditional Maratha dish Amti, a lentil stew but to the horrors of the royal cooks, they had ran out of Moong bean and Kokum, a souring agent; which were the traditional ingredients needed to cook Amti. So, the cooks were forced to use toor dal (Pigeon peas) in place of moong dal and tamarind pulp instead of Kokum; and also added ground Coconut and vegetables. Since the guest was the Maratha King Sambhaji, the son of Shivaji, the newly created dish was named Sambar in the honour of the guest of the court. So there it is. The history of Sambar. Interesting, isn’t it? Coming to today’s recipe of Samabr, it is the famous Tamil Brahmin or Tambrahm Arachuvitta Sambar or Tiffin Sambar. The Tamil word ‘Arachuvitta’ literally translates to ‘to grind’ which is evident as the recipe uses freshly ground paste which just adds not enhances the flavour but adds oodles of character to this dish. 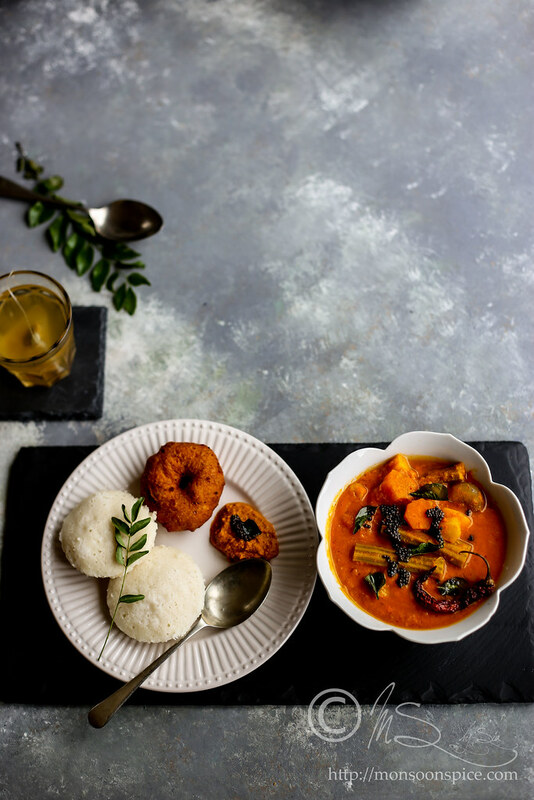 The consistency of Arachuvitta Sambar is on a little thicker side, almost a stew like, making it a perfect accompaniment for idli, dosa or plain rice. There are three different lentils which plays a major role in this recipe, toor dal (split pigeon peas), chana dal (split chickpeas) and urad dal (split black lentils). 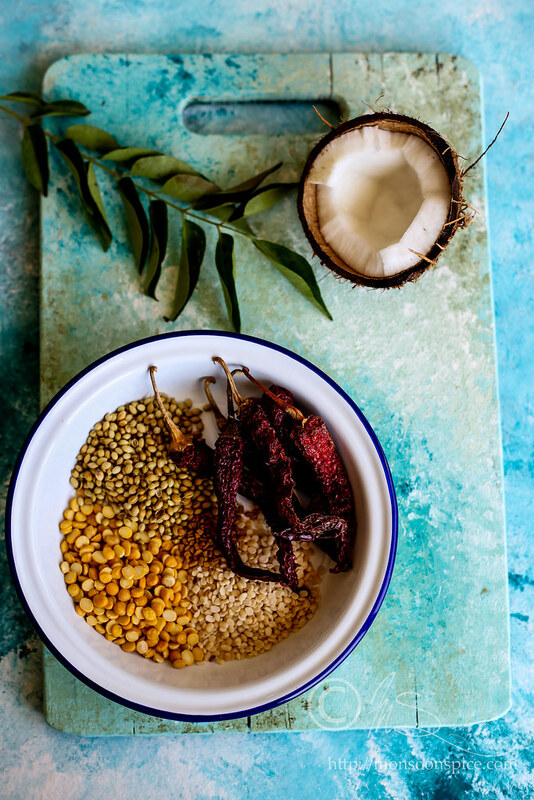 While cooked toor dal forms a base for the gravy, chana and urad dal are roasted with the spices and ground with fresh coconut. One another main ingredient is the tamarind pulp, a quintessential souring agent in South Indian cuisine. 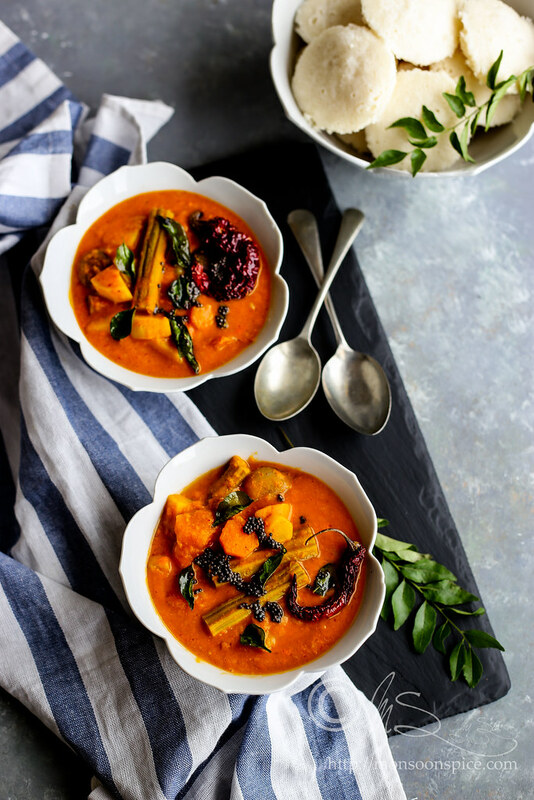 This sambar can be made with just the pearl onion or shallots (popularly known as sambar onions in South India) and drumsticks, but addition of vegetables like radish, carrot, potato or chayote makes this a power house of nutrition. So without further ado, let’s get cooking delicious pot of Arachuvitta Sambar. Wash the toor dal 3-4 times until the water runs clear. Pressure cook it with 2 cups of water, turmeric powder and a few drops of oil for 3 whistles (about 12-15 minutes). Let the pressure release completely before opening the lid. Alternatively, you can cook the dal in a thick bottomed pot with lid until they turn soft and mushy, about 15-20 minutes. While the dal is cooking, soak tamarind pulp in about ½ cup of hot boiling water. Keep it aside until needed. Trim the ends of sambar onions or shallots and peel them. Peel and chop carrots and radish into 1 cm thick rounds or 1 inch cubes. Peel the potato skin and dice them into 1 inch thick cubes. Scrape the skin of drum sticks and cut them into 2½-3 inch long pieces. Heat ½ tbsp. oil in a pan and add chana dal, urad dal and fenugreek seeds. Roast them on low flame for about a minute and then add coriander seeds and dried red chillies. Fry them on low flame for a minute or little more until the spices and lentils are nicely roasted and turn golden. Mix in freshly grated coconut and turn off the flame. The heat in a pan is enough to roast the coconut. Let the mixture cool little before grinding them to powder without adding any water. Don’t worry if the mixture is little coarse. Keep it aside until needed. Heat oil or ghee in a pan and once hot, add mustard seeds, dry red chillies, hing and curry leaves in that order. When mustard seeds start to pop and splutter, add the vegetables and stir fry them for a minute. Pour in about 3-3½ cups of water, jaggery and salt to taste. Cover and let it cook for 7-8 minutes, on medium to high flame, or until the vegetables are almost cooked. Extract the tamarind juice and discard the pulp. Mash the cooked dal or alternatively, roughly grind them in a mixer grinder or food processor. Add the mashed dal and tamarind extract to the pan and mix them all well. Check for the seasoning and adjust as per taste. Also add little more water if you find the gravy too thick to get desired consistency. Let the gravy simmer for 3-4 minutes. Finally, add the ground spice and coconut powder and mix them all well. Reduce the heat to low and let the gravy simmer for 4-5 minutes for all the flavours to blend well. Turn off the flame and let the sambar rest covered for 10 minutes. 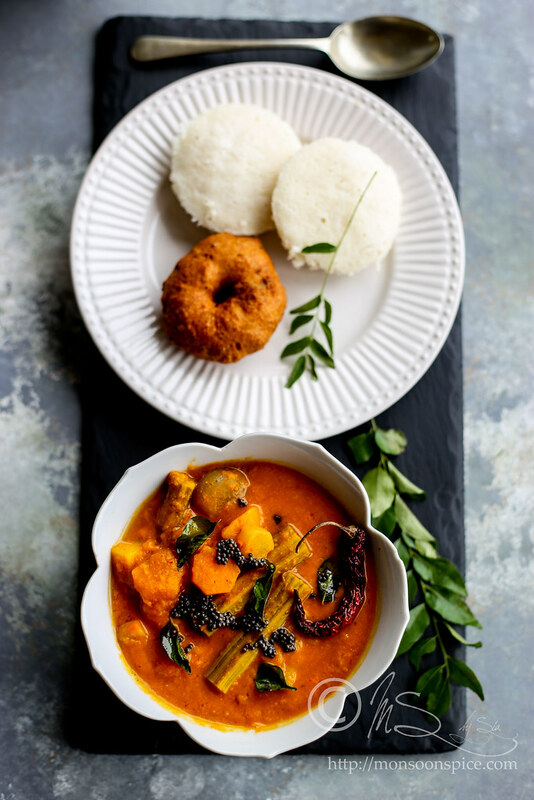 Serve this delicious Arachuvitta Sambar with idli, dosa or rice and enjoy! Take care when roasting the spices and make sure to continuously stir the spices on low flame. The burnt spices will turn the dish taste bitter. So just be little careful. 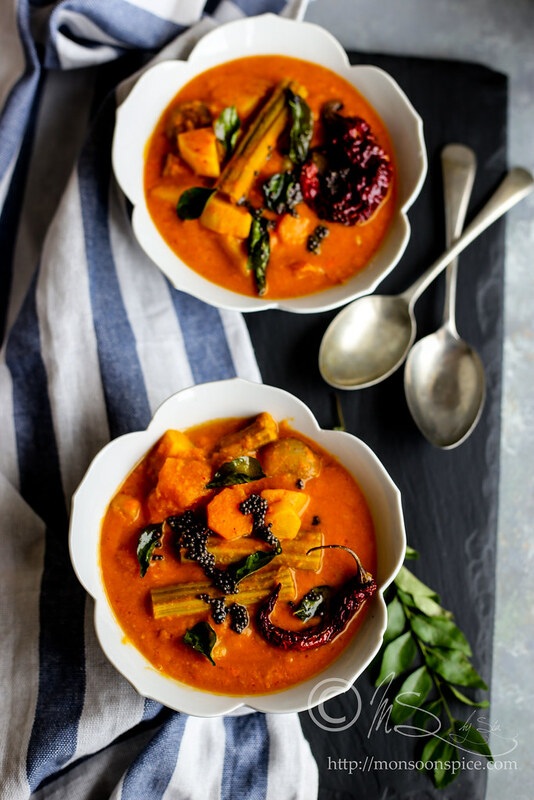 This sambar can be made with just the pearl onion or shallots (popularly known as sambar onions in South India) and drumsticks, but addition of vegetables like radish, carrot, potato or chayote makes this a power house of nutrition. 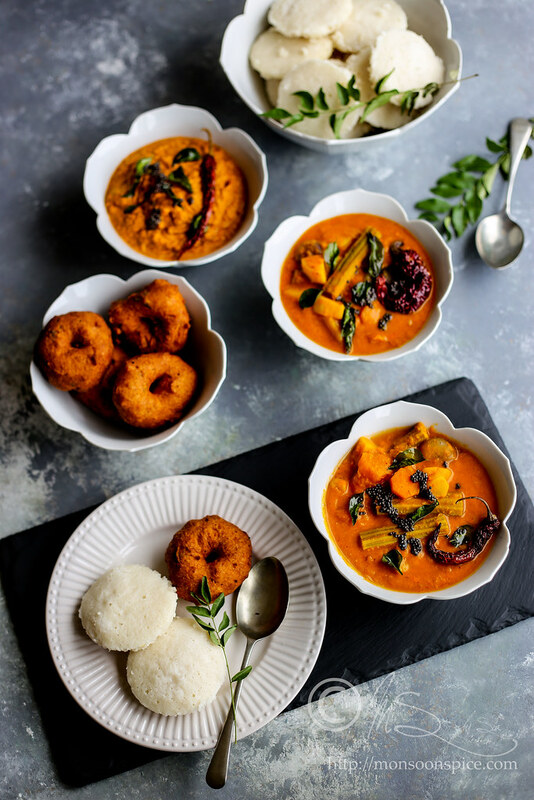 The idly, Vada and sambar are looking so good, have to try this soon !! This looks like a fabulous recipe. I see you have labeled it as “easy” to make!